ItemF-08534 - Heronville, Grouse Creek. Cariboo. ItemC-09286 - Native woman examing a child's head (which moved) for native runners and immolating them when found between her teeth. Mosqueem [Musqueam] Indian encampment on the Fraser River. Queens Birthday Visitors 1865. ItemE-04419 - Indians shamming to be at prayer for the sake of photography. Fraser River . At the priests request all the Indians kneel down and assume an attitude of devotion. Amen. ItemF-08291 - Songish [Songhees] Chief's sister with fish for sale. ItemC-09289 - Fraser River. Oolachons [oolichan] drying - basket cradle - rush house for a family of eight. Candle fish. Rush mats for sleeping on, and lice to keep them awake. ItemA-06164 - Fraser River Siwashes. ItemA-06918 - Sooke [T'Souk-e] Indian Woman V.I. [Vancouver Island]. ItemF-08505 - Fraser River Indians. 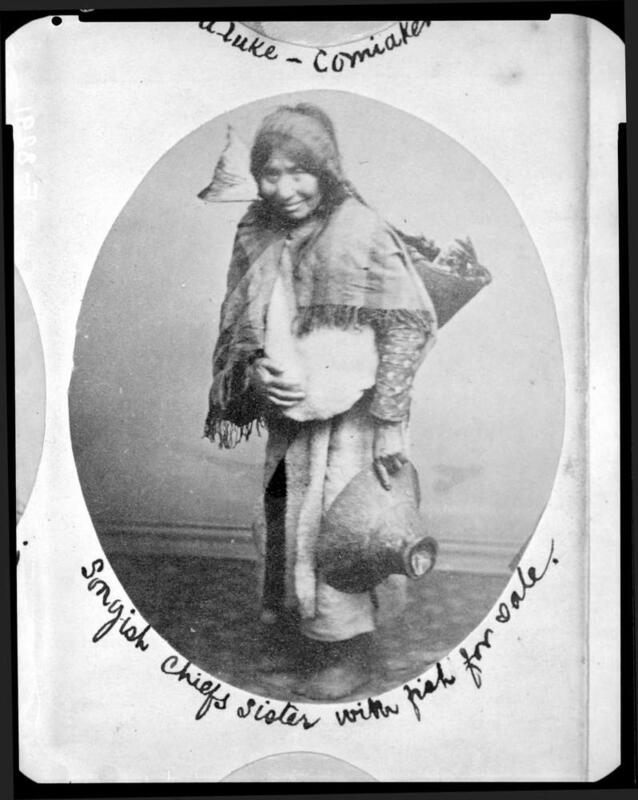 Item F-08291 - Songish [Songhees] Chief's sister with fish for sale. MS-3100, Album 5, Page 1.